Hello friends! I've been busy again :) Just love this Club Scrap Paris Flea Market kit! 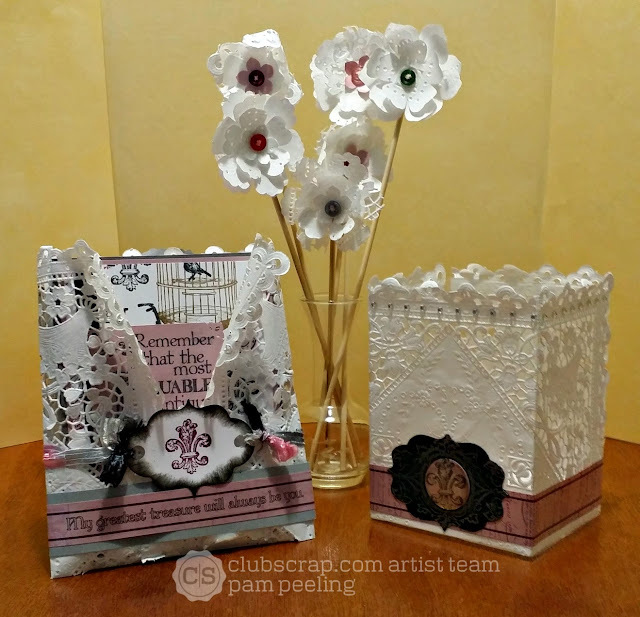 This project is for the Club Scrap Artist Team Challenge. If you've come from Esther's blog then you're following right along. 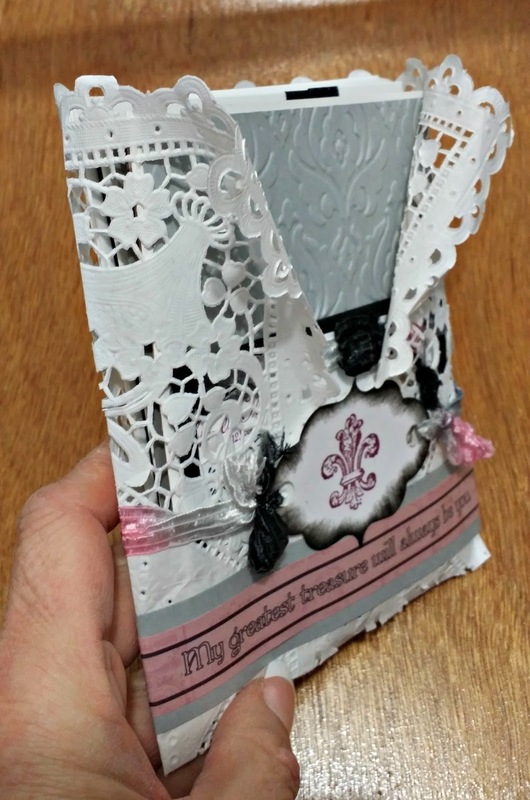 The challenge was to use the paper lace mattes and/or white die cuts in new and unique ways. So...I made a Luminary, Reed Diffuser and Card Holder. Start by cutting the acetate 6 1/2 x 10" and 6 1/2 x 4 1/8." Score the 10" piece on the long side at 3 1/4, 6 7/8." On the short side score at 4 5/8." 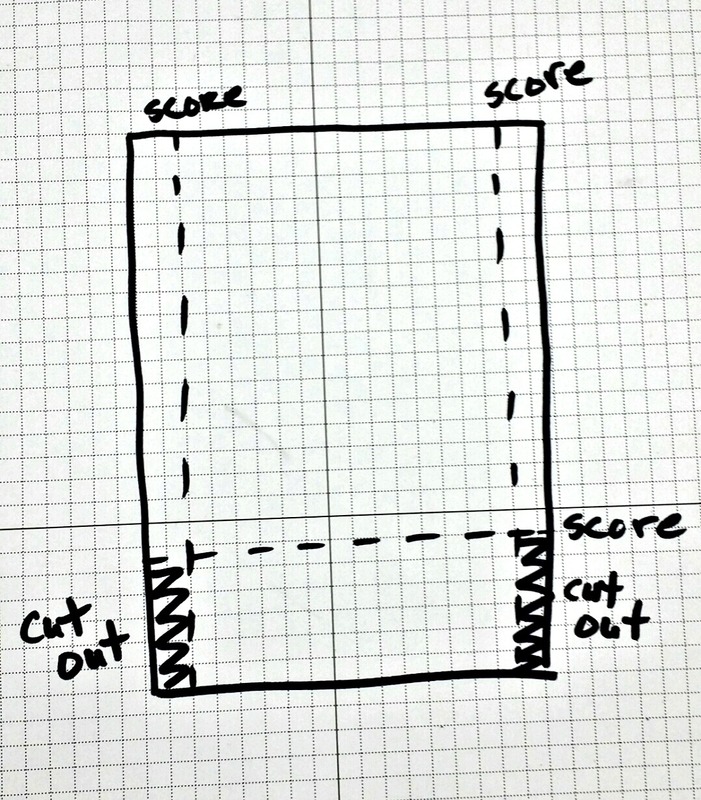 Score the 4 1/8" piece on the short side at 1/4" from each side. On the long side score at 4 5/8." Fold on the score lines. Use a bone folder to really fold them well. 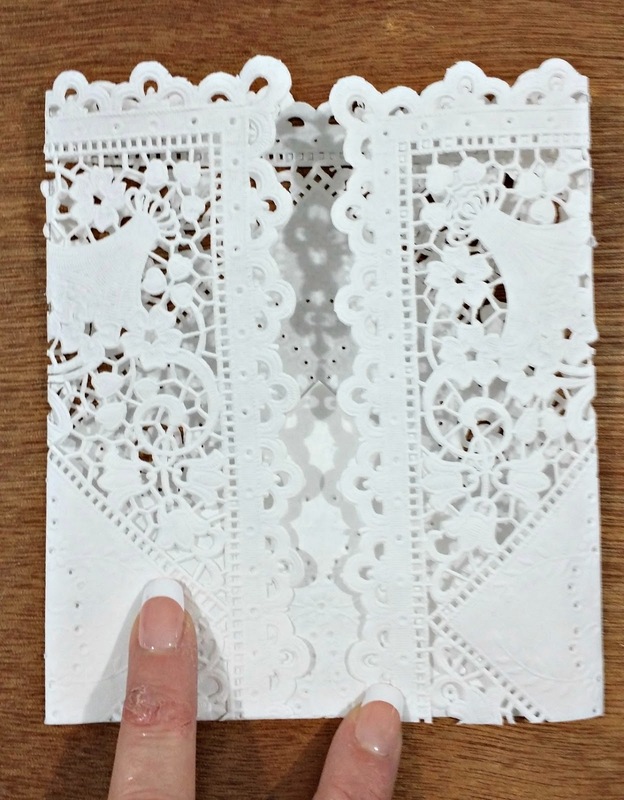 The acetate is stiff and you'll want a nice crisp fold. 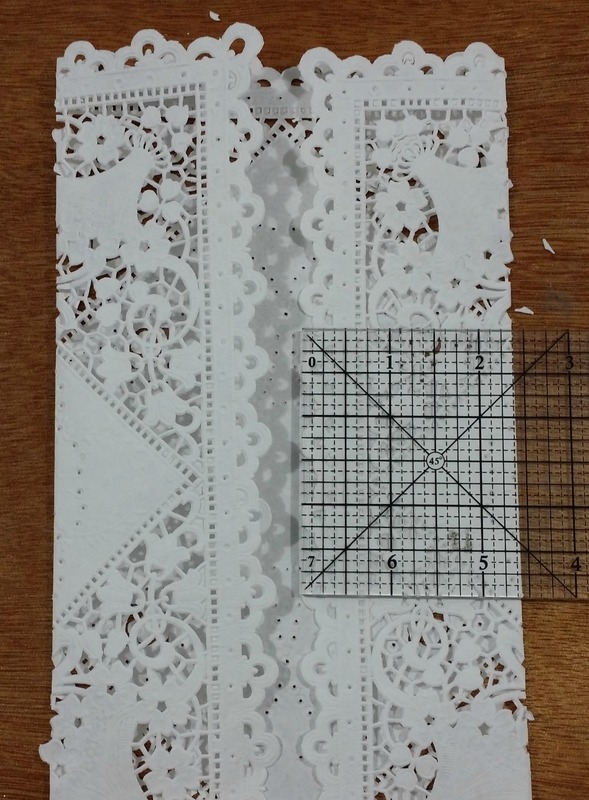 On the 4 1/8" piece cut away the parts on the 1/4" sides after the 4 5/8" score lines. On the 10" piece snip along the score line from the bottom edge up to the 4 5/8" score line. 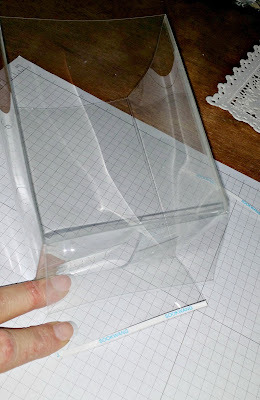 Place scor-tape on the edges and adhere the 4 1/8" piece making a box - as below. 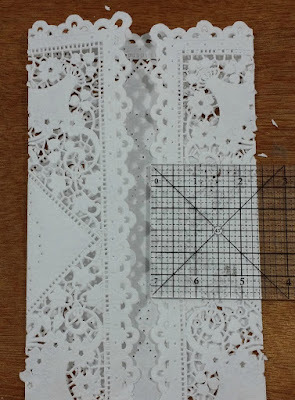 Cut one of the paper lace mattes in half. 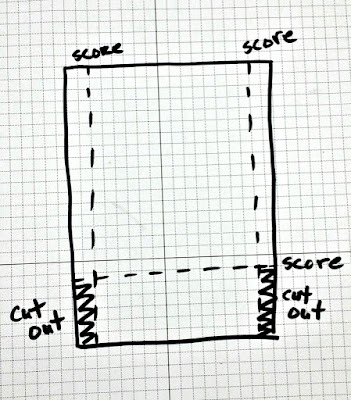 Score at 3 1/4" and 6 7/8" and fold on score lines. 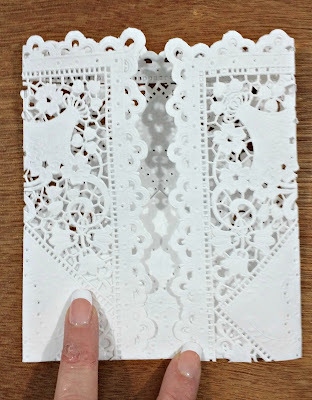 Be careful with this part though as the paper lace is delicate. Cut the other piece 3 3/4 x 5 1/8" from the middle of the other half of the matte so it matches the other side. Now for the Reed Diffuser! 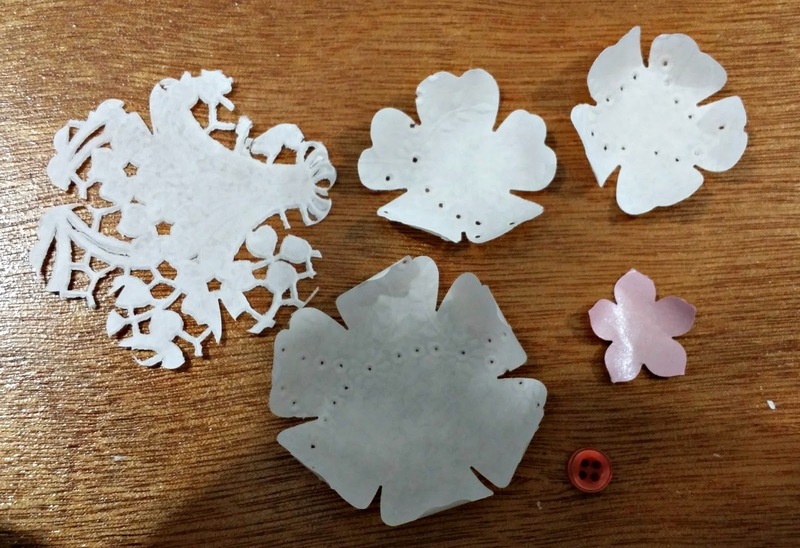 First I cut a bunch of flowers from different parts of the paper matte. Some more solid and some on the lacy part for variety. Then with my bone folder I curled up the edges of the petals a little. 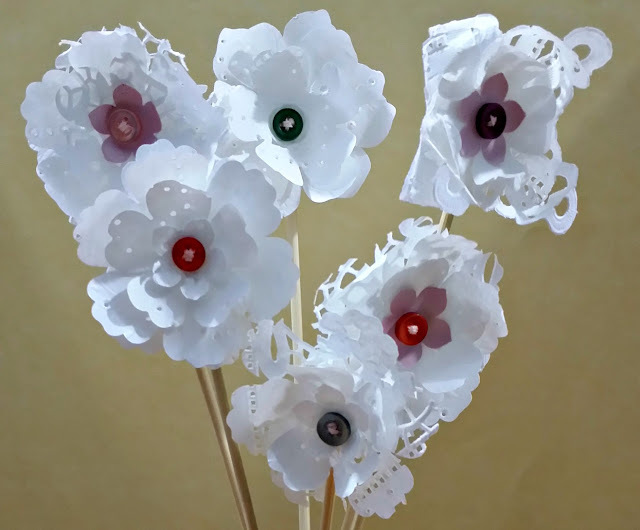 Then I stacked a few of the flowers together and hand sewed them together with a button on the front. I did a few stitches, then sewed the flower to the skewer. I basically just wrapped it around and tied it a few times to make it solid. I experimented with gluing the flowers together and to the skewer but the oil that scents the "reeds" affected the glue and it didn't stick anymore. 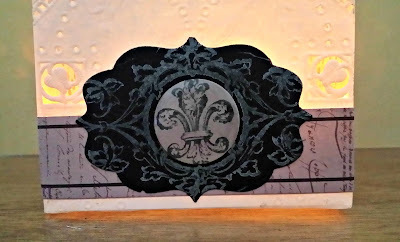 Also I tried various kinds of ink pads to stamp or color the flowers and the oil made the colors run and bleed. Even Stazon didn't work very well. It's ok I like the plain white with the colored button and string anyway! I cut some of the skewers a little shorter just so they looked nice in the vase. I found a bunch of small vases at my local Thrift Store that are perfect for this. I added some scented oil and done! They have jars of the diffuser oil at Walmart for like $2.00. Or you could make your own with some sweet almond oil and a few drops of your favorite essential oil. 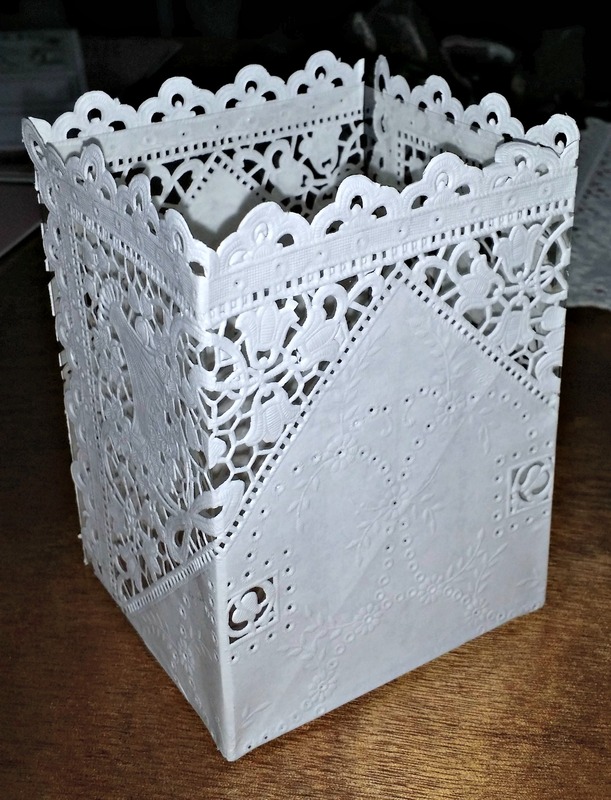 4 Cards and envelopes fit into the holder. It was perfect for my Club Scrap March Technique Masterboard cards! 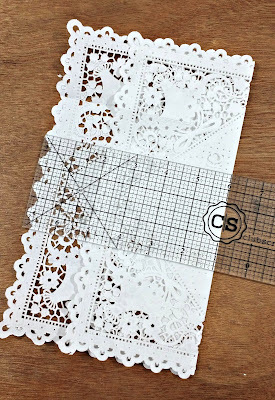 Start with a whole lace matt and folded 2 opposite sides into the middle. 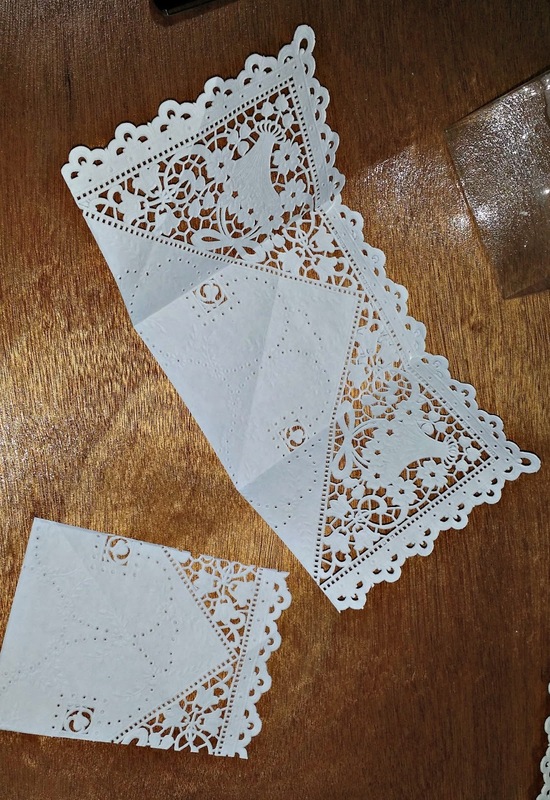 I didn't have them quite meet...I folded at 2 3/8" from each side. 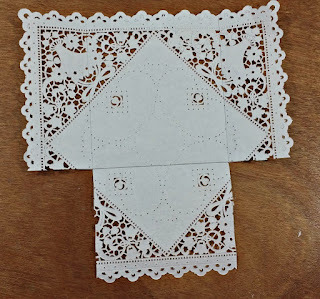 Then I folded up 4" from the bottom. 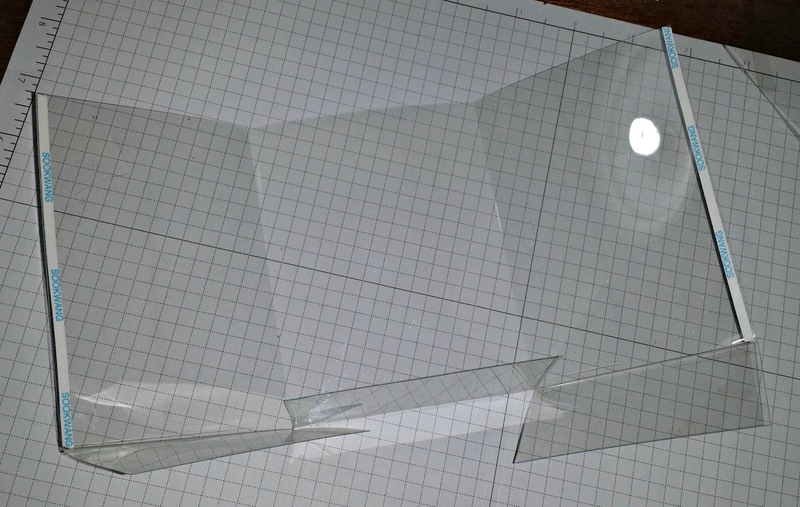 Cut out the 2 small squares formed by the fold lines in the 2 bottom corners. I put pencil lines where the fold lines are so you can see them better. 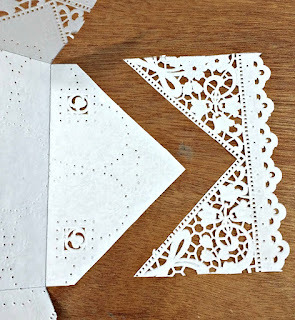 I also cut away the "lacy" part to the solid V part-just for bulk and ease of getting the cards and envelopes into the "envelope." 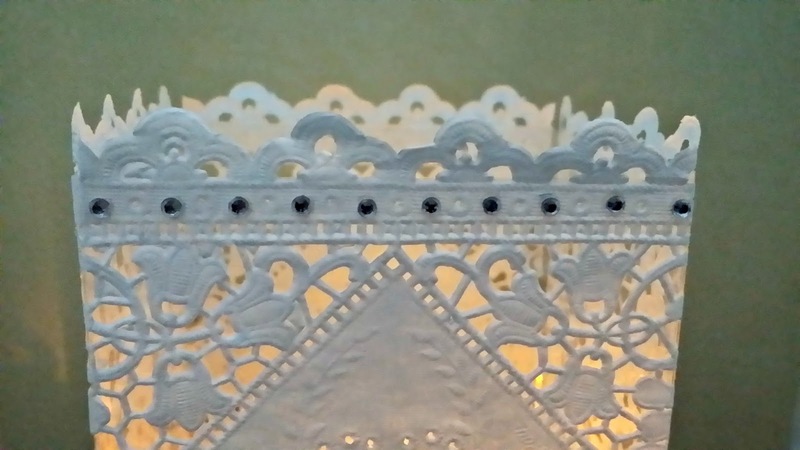 The corners catch terribly on the lacy parts when you try to slide in the cards. 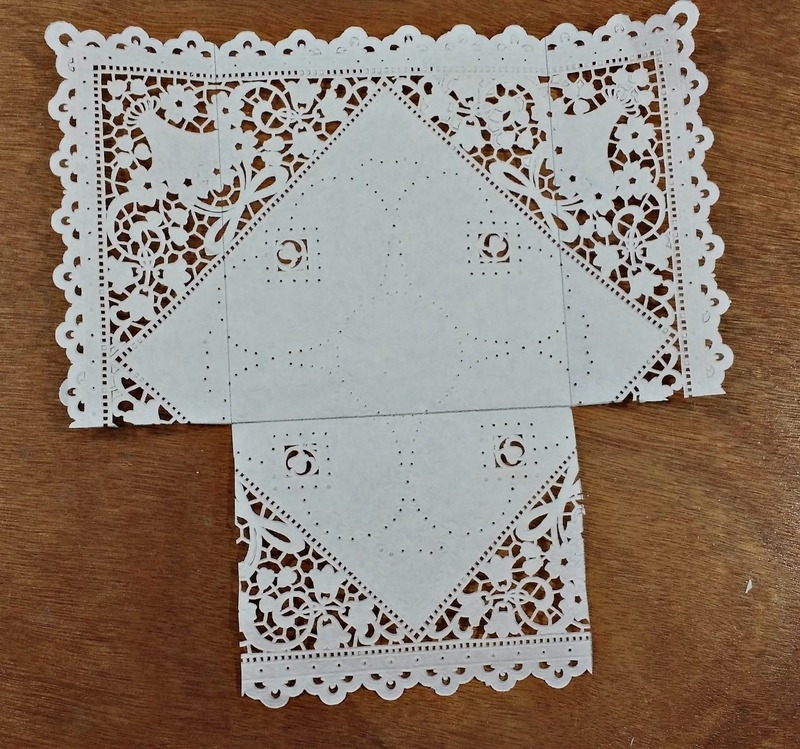 Then fold up the triangle part and fold over the 2 sides. 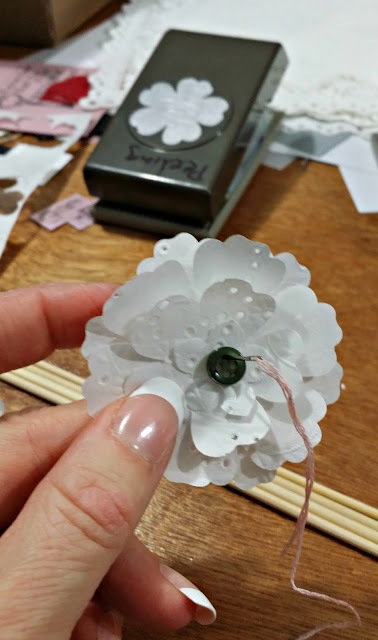 Adhere with glue dots. Then decorate anyway you want! I kind of rounded the top part that wasn't connected to give it that folded open look. Then just decorated with other Paris Fleas Market papers and ribbon. 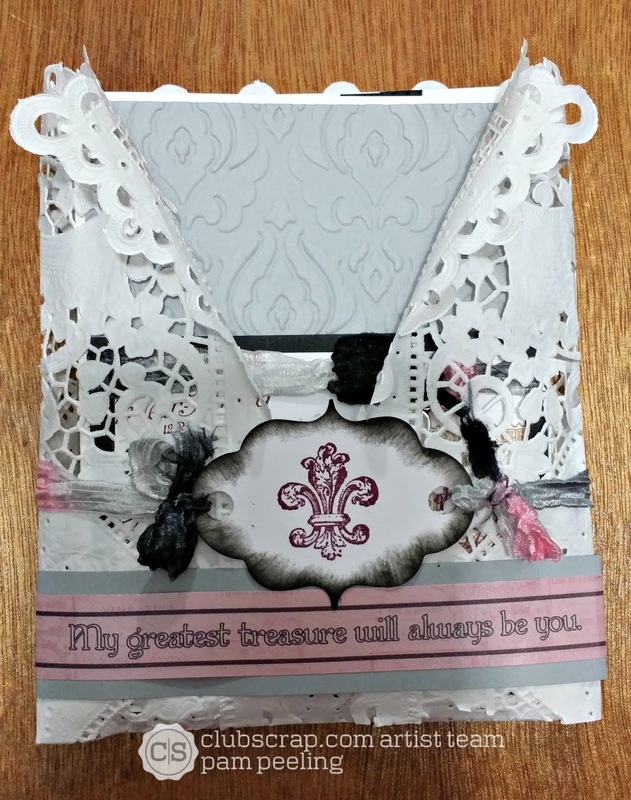 These paper mattes were so fun to play with!! I hope you get a chance to try them out! 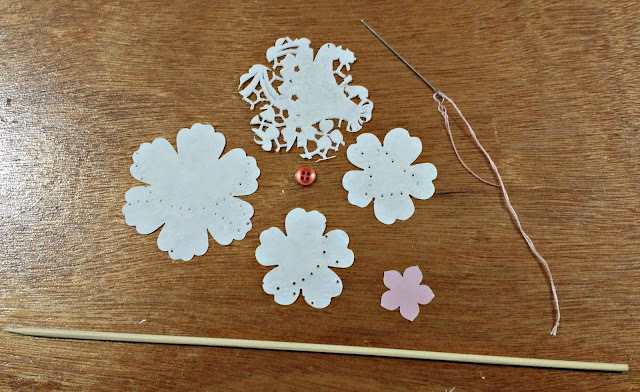 Check out Hetty's blog to see what she did with them! 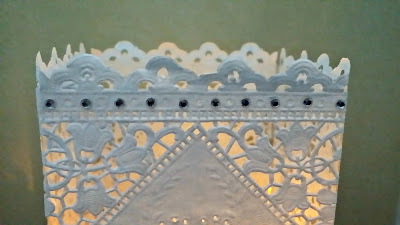 I adore that lightbox!!! 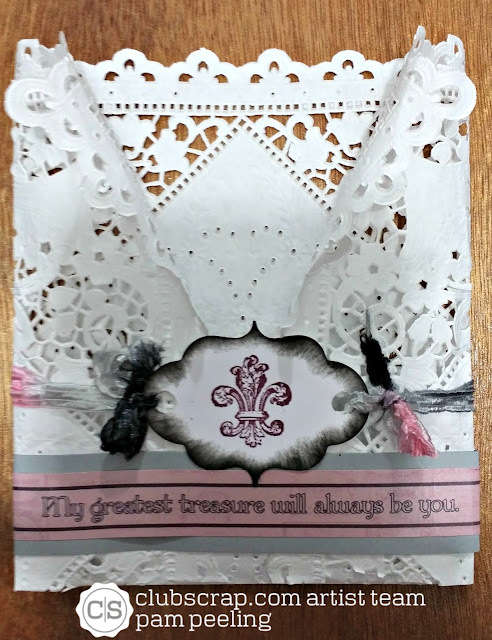 Gorgeous projects!! 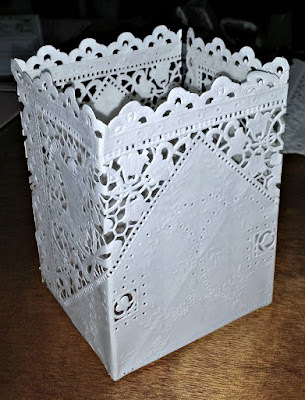 All your projects are wonderful, the flowers are so creative and the candle box is so awesome! You have outdone yourself Pam! The luminary is AMAZING! How creative! All of your projects are wonderful! 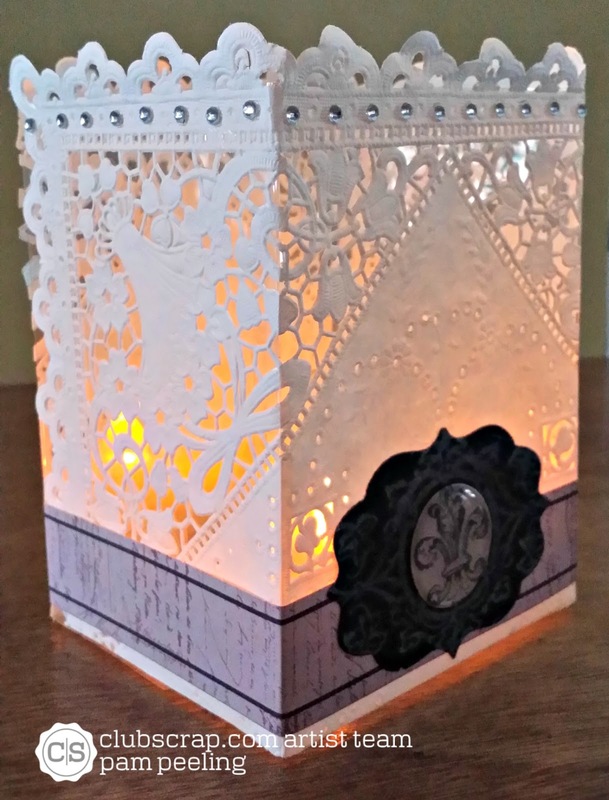 I love your projects- my fav is the luminary- so cool! Lovely ideas here, Pam! Thanks for sharing. WOW!! I love the flowers, so cool! The luminary is my favorite! All your ideas are unique and spectacular! Thanks for the detailed directions. You have outdone yourself, so many great projects I have a hard time deciding which is my favorite! This produced a "Pinning Streak" of great ideas. Wow, Pam! I'm blown away! Great ideas!!! So pretty! The reed diffuser is a lovely bouquet!! All just great!! 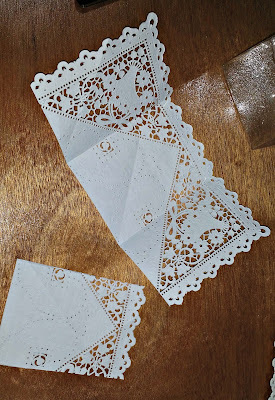 Such fun ideas - love love love the luminary!! Love these ideas. I will be using the luminary idea for an event I have coming up. Thank you for sharing. Love all your projects but I really love the luminary. I am definately going to try it out. 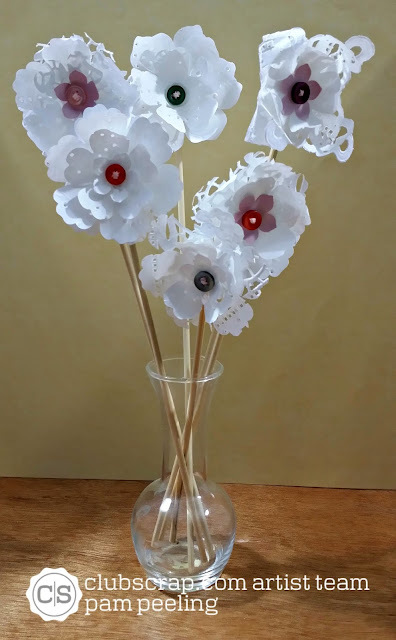 Awesome projects, I especially like your take on lace flowers - they look so great!!! 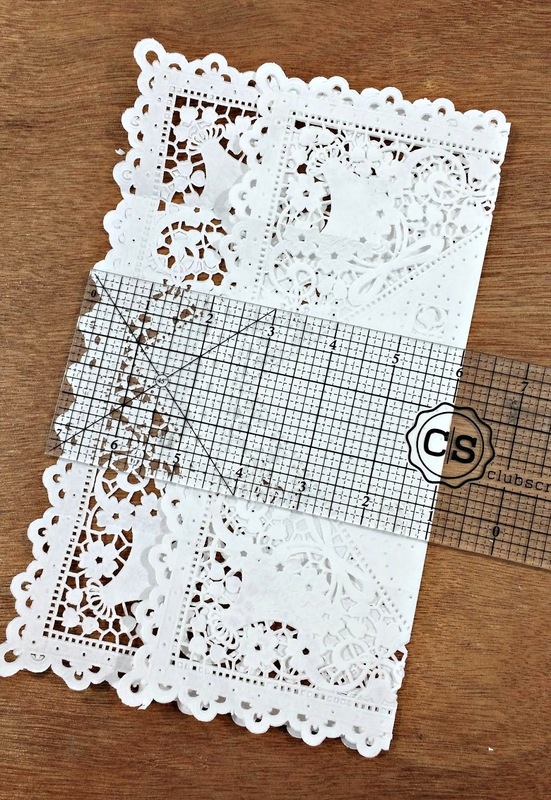 The flowers are an especially beautiful way to use the gorgeous lace! These are awesome ideas! Love the flowers!! !